My name is Shaun Wood, I am a primary and intermediate teacher and passionate about e-learning, game based learning and environmental education. Welcome to the Digital Technologies group on VLN. Keen to have your ideas and thoughts added. Start discussions, ask to added as a contributor to resources I have posted. Keep each other up to date with news that you hear about to do with this area. Let’s use our contacts to keep everyone up to speed with Digital Technologies as it develops in N.Z. Thank you for joining the Connected Rotorua Teachers group. Please feel free to use resources, share your questions and experiences in discussions. Welcome to the iPad group. Hope you find it useful. I'd like to encourage you to browse the sub-communities and join those that appeal to your interests and passions - there are some great discussions running in them already. Check out our blog for the week's round-up of e-learning goodness: /pg/blog/owner/group:118255. Look forward to working with you! Ngā mihi nui, nā Karen. PowerPoint is a fantastic program that you can use for many other purposes aside from slideshows. I now often use it to write lesson plans or other text that I want to print onto A4 paper. I have also used it to print A3 posters, make website banners, and square cover pages for my TeachersPayTeachers site. The video below will teach you how to do this simple but handy trick. Kids are more focused and excited when completing tasks to a visual timer. I use timers for learning centers, station activities, clean up, testing, and games; I'm sure you know a few other uses too. 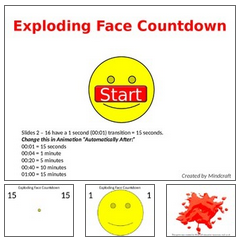 I recently made an Exploding Head Countdown Timer (available for free at TeachersPayTeachers) but it is easy to create your own, check out the screencast below to learn how to create your own PowerPoint Countdown Timer. On Saturday I was honoured to present at the fourth virtual TeachMeetNZ. TeachMeetNZ is run by Sonya @vanschaijik live on Google+ and is way for New Zealand educators to get together and share their learning. TeachMeetNZ presentations are based on Pecha Kucha style of limited and timed slides. I found it to be a great reflective experience having to sum up ones thoughts and still deliver an interesting message. I started pondering the critical thinking skills involved and realised it would be amazing for my students too. I shared my experiences using Minecraft as a tool for teaching and learning, and have included the resource links below for easier access.